Chemguard, the global leader in foam concentrate and foam systems R&D and manufacturing, and Williams Fire & Hazard Control, the world expert in flammable liquid fire suppression, have formed an alliance to develop high-performance fire-fighting foam concentrates. Chemguard and Williams introduced the first products resulting from their collaboration this month: ThunderStorm F-601B, a 1x3 alcohol-resistant aqueous film-forming foam (AR-AFFF), and F-603B, a 3x3 AR-AFFF. Both foam concentrates are suitable for hydrocarbon and polar solvent fires. 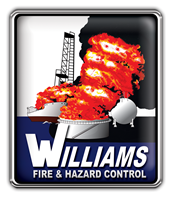 “We expect our work with Chemguard, the only fully integrated global fire-fighting foam concentrate manufacturer, to result in significant product development and noteworthy fire-fighting performance enhancements,” added Dwight Williams, Williams Fire & Hazard Control CFO and chairman. ThunderStorm F-601B and F-603B AR-AFFF foam concentrates, the first in a line of “next evolution” foam concentrates, exceed the highest performance standards in the industry. Formulated from special fluorochemical and hydrocarbon surfactants, high-molecular-weight polymers, and solvents, ThunderStorm F-601B and F-603B have a much lower viscosity than other 1x3 and 3x3 polar-solvent AFFF products, which enhances performance in foam proportioners, in-line eductors, balanced-pressure systems, and other equipment. Fully compatible with current ThunderStorm reserves, F-601B and F-603B offer improved extinguishment and enhanced firefighter safety for both conventional Class B hydrocarbon fuel and polar solvent Class B fuel. Because of their excellent wetting characteristics, ThunderStorm F-601B and F-603B also are effective on Class A fires.